I’ve done some cleaning up of SoCalSail’s weather page. Mainly, I’ve updated the map showing weather buoys so it matches the current version of the National Buoy Data Center’s Southwest California Recent Marine Data page. I remember how excited I was when I first saw the progenitor of that page a number of years ago. That was back in the mid-1990s, when doing cool things on the Web still had a clubby, subversive feel to it. Here, I realized, was the work of a kindred spirit, someone who felt the way I did about putting useful content online. In a funny coincidence, I subsequently was at the second annual Perl conference, and struck up a conversation with the young man I happened to be sitting next to. We asked each other the standard Perl conference question (“So, what are you doing with Perl?”), and I practically fell out of my chair when he told me that he worked for the National Weather Service in Florida, and had recently used Perl to put together a little CGI application to report observations from weather buoys. His name was Dave Faciane, and meeting him was definitely one of the highlights of that conference for me. I’ve lost track of him since then, and several years ago the application he built was moved to a new server and his name removed from the credits, but I remember that chance meeting, and thinking about it now reminds me of those good old days when the Web was first being imagined into existence. Anyway, give the new weather observations page a try, and let me know if you notice any problems. 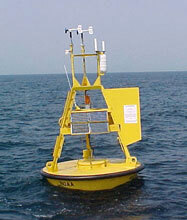 Some day soon I hope to update it to do automated processing of the buoy data, so I can display a version of the map with near-real-time wind data graphically displayed on it. From that it would be a short step to doing an animated version of the same map so you could see how wind conditions had been changing over the last 24 hours. I think that would be pretty cool. And I bet Dave Faciane would get a kick out of it if he saw it.